Oyeniran, Channon. "Black Loyalists in British North America". The Canadian Encyclopedia, 25 March 2019, Historica Canada. 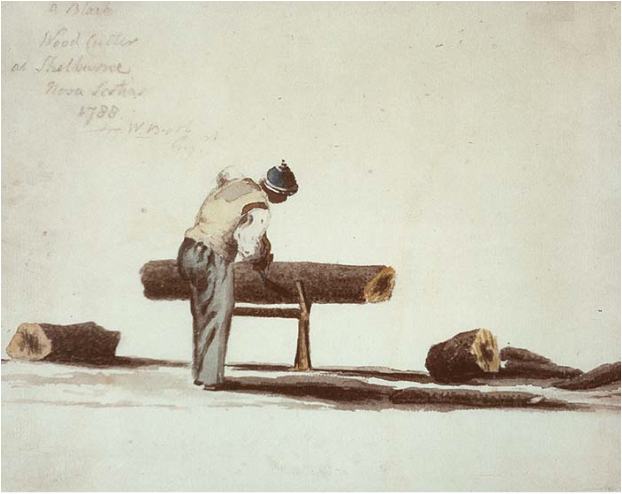 https://www.thecanadianencyclopedia.ca/en/article/black-loyalists-in-british-north-america. Accessed 23 April 2019. During the American Revolutionary War (1775–83), thousands of free or enslaved Black people fought for the British, hoping to gain their freedom along with the promise of land. By 1783, when the Treaty of Paris was signed, British forces and their allies fled to such locations as Europe, the West Indies (the Caribbean) and the Province of Québec (divided in 1791 into Upper Canada and Lower Canada ). Between 1783 and 1785, more than 3,000 free Blacks or former enslaved people settled in Nova Scotia , where they faced hostility, racial segregation, low-paying jobs and inequality (see also Arrival of Black Loyalists in Nova Scotia). 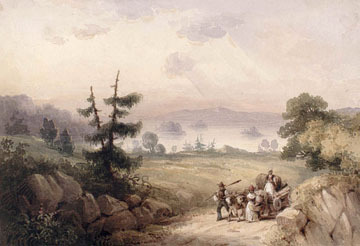 "Bedford Basin" by Robert Petley watercolor 1835 depicts a family of Black Loyalists in NS. The institution of enslavement was commonplace in the 18th century, particularly in Britain’s American colonies (what we now know as the United States of America). However, the colonists were not content with how much control the British government had over life in the colonies and wanted to exercise more independence. Unable to come to a mutual agreement with Britain, the colonists declared themselves independent of Britain, leading to the American Revolution (also known as the American War of Independence). When control of Virginia was being lost to the rebels in 1775, the governor of Virginia, Lord Dunmore, sought to recruit soldiers to fight for the British. He issued a proclamation that any enslaved or indentured person would be given their freedom if they joined the British forces. The response was overwhelming — some 800 Black enslaved or indentured persons joined the British, although even more had tried to reach the British lines. In 1779, when it was becoming apparent to the British that they were losing the war, the British Commander-in-chief, Sir Henry Clinton, issued the Philipsburg proclamation, which said that any Black person who deserted the colonists’ side and joined the British would receive “freedom and a farm” — full protection, freedom and land. Thousands of people of African descent joined the British Loyalists . It is estimated that as many as 100,000 enslaved persons eventually took asylum behind British lines. By the summer of 1782, it was clear that the Americans were winning the war, and the British started to prepare for their departure. By 1783, the British officially lost the war and the Treaty of Paris was signed. British forces and their allies had to leave the United States. The British left a number of Black people behind as they retreated, many of whom were recaptured into slavery. Other Black Loyalists were resettled in Florida, the West Indies, the future Upper and Lower Canada	and the present-day provinces of Nova Scotia and New Brunswick . Thousands of White Loyalists and their enslaved persons joined the British in the fight against the American colonists. Some of these enslaved persons were enlisted in Lord Dunmore’s “Ethiopian Regiment.” However, to soothe the anxieties of slaveholders, who were fearful of enslaved people using guns, Lord Dunmore placed the men in roles such as digging trenches, shoe-making , blacksmithing	and carpentry . Meanwhile, the women worked as nurses, cooks and seamstresses. As the war progressed and the British and their allies recognized the need for more manpower, Black enslaved men were armed with guns and sent to the battlefield. As the war was coming to an end and British defeat was inevitable, many White Loyalists and thousands of their enslaved persons left for places like Florida, Bahamas, Jamaica and other territories owned by the British throughout the Caribbean. All enslaved persons who escaped and fought for the British before 30 November 1782 were to be set free. To determine which enslaved persons were to receive their freedom, information such as their name, age and dates of escape was recorded in The Book of Negroes	(see also Lawrence Hill’s The Book of Negroes ). With certificates of freedom in their possession, these formerly enslaved persons headed to Nova Scotia after the war to begin new lives. Approximately 3,000 Black Loyalists departed New York in 81 ships heading to Nova Scotia between April and November of 1783. Some arrived as hired workers, indentured workers, apprenticed workers, or as free persons; some travelled on their own accord. A little more than 1,200 enslaved people came to Nova Scotia with their White Loyalist owners; they were the largest single group added to the black enslaved population in the Maritimes. Once they arrived in Nova Scotia, Black Loyalists and enslaved persons alike were sent to and settled in places like Shelburne , Birchtown, Annapolis Royal	, Preston and Digby . Among the various towns, Birchtown shortly became one of the most populated settlements of Black people (free and enslaved) outside of Africa, at that time. After arriving in Nova Scotia, disenfranchisement soon set in; the promises of freedom, equality, jobs and land were often unfulfilled. Working in low-paying jobs, being on the brink of starvation, and experiencing segregation in all aspects of life proved to be the reality for Black Loyalists in Canada. Many Black Loyalists who arrived in Nova Scotia after the war endured these hardships and challenges. Although they were promised land, many of them were met with broken promises. They also found harsh conditions such as starvation, indentureship, exploitation of cheap labour, severe winters, lack of educational opportunities, racism, and shortages of food and clothing	. Although Black Loyalists were promised land, so too were approximately 30,000 White Loyalists. Black Loyalists were at the back of the line when the time came to divide and allocate land. In Birchtown in 1787, the first Black people finally received their land grants, four years after their arrival. However, it was far less acreage than their White counterparts received. This long wait and shortage of land was also experienced by Black Loyalists in other Nova Scotia towns, such as Digby and Brindley Town. The long-awaited and sometimes unfulfilled promises of expected land grants, as well as the other challenges they faced, was too much for many. In 1792, approximately 1,200 Black Loyalists set sail for Sierra Leone to establish the new colony of Freetown. Those who stayed behind continued to try and build a better life for themselves. Black people in the Maritime provinces also encountered racism. One event against Black people began on 26 July 1784 and lasted for about 10 days. The Shelburne race riots	saw black property destroyed by White Loyalists in Shelburne and the Birchtown area. Disgruntled with poverty, the lack of work (which they blamed on cheaper Black labour), and the delays in receiving land that was promised to them, White Loyalists decided to take out their frustrations on free Black people. Religion was a very important part of everyday life for Black Loyalists. In the face of their challenges and struggles, they turned to each other to create a sense of community. The Black Loyalists and other Black persons who made up the various communities across Nova Scotia established their own schools and churches, and congregations of Anglican and Methodists	were set up in towns like Birchtown, Brindley Town and Little Tracadie. Notable church leaders, such as William Furmage, William Ash, Moses Wilkinson and Boston King, led congregations from both denominations. David George, the pastor of the first Black church in North America in South Carolina (c. 1773), and a former enslaved person, introduced the Baptist church in towns across Nova Scotia, including Preston, Halifax, Digby and Liverpool. The sense of hope that religion brought to the Black community in Nova Scotia in the late 18th century was a welcome source of respite in the midst of the challenges and hardships they faced. Although a large majority of Black Loyalists were sent to Nova Scotia after the American Revolution , several hundred arrived before and after the war in what would become known as Upper Canada (created in 1791). They arrived either as free persons or as enslaved persons with their White Loyalist masters. Many settled along the St. Lawrence River	to the Bay of Quinte and in settlements in the Niagara Peninsula and along the Detroit River	. Also, some enslaved Black people settled, along with their Loyalist masters, in the area soon to be known as the Eastern Township s in Lower Canada	(now Quebec ). One notable Black person who obtained his freedom by fighting for the British in the American Revolution was Richard Pierpoint	, an African man from Senegal, who was captured and sold into slavery in 1760. Pierpoint was honorably discharged from the Butler’s Rangers unit and settled in the Niagara region. Unlike his Black Loyalist counterparts in Nova Scotia, Pierpoint received 200 acres of land. Pierpoint and other Black Loyalists in Upper Canada also played a significant role supporting the British in both the War of 1812 and the Rebellions of 1837–38	(see also The Coloured Corps: Black Canadians and the War of 1812 ). 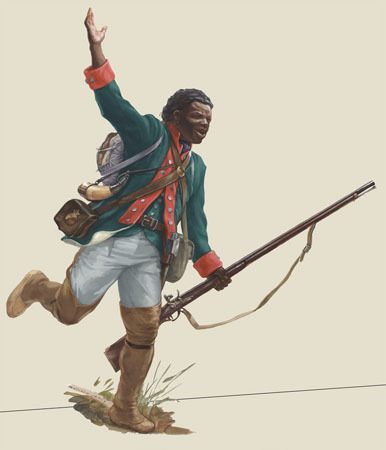 An illustration of Black Loyalist Richard Pierpoint. Wherever Black Loyalists settled in British North America , whether in Nova Scotia, Upper Canada, Lower Canada or other British territories, they generally faced challenges, hardships, trials and tribulations. For example, while the Nova Scotia government provided land to both Black and White Loyalists, the Crown did not provide land titles to Black settlers. This meant that Black Loyalists who settled never officially owned the land they lived on. Without clear title, residents cannot sell their property or legally pass it down to other relatives. In 2017, the Nova Scotia government announced that it would spend $2.7 million over two years to help African Nova Scotians in five historically black communities to obtain clear legal title to land that has been in their families for generations. Black Loyalists in British North America have left a lasting legacy, and their memory and accomplishments live on today. In Nova Scotia, the Black Loyalist Heritage Centre, located in Shelburne	, and the Black Cultural Centre for Nova Scotia , located in Cherry Brook, are just two places dedicated to memorializing the heritage and legacy of Black Loyalists. Black History in Canada Archival and published sources at Library and Archives Canada. Website of the Black Loyalist Heritage Centre and Birchtown’s Historical Site. Black Halifax, Stories From Here is a multidisciplinary project that celebrates Halifax’s vibrant historical Black community. Website of the Black Cultural Centre for Nova Scotia.